Select a QR code generator that allows you to create QR codes easily and download them. You can use a free QR code generator like Beaconstac’s and create QR codes that are free forever with unlimited scans. QR codes on product packaging can either be a Website QR code, Video QR code or even Coupon QR code. Once you settle on the intention behind placing the QR code on the packaging, you can decide what type of QR code is right for your product. Input all the required information. For instance, if you are making a URL QR code, enter the URL in the QR code generator. Did you know that the same QR code can be used to display different information at various points in the day, week or month? These are known as dynamic QR codes and serve you well for product packaging. You can always use free static QR codes but note that once you print them out, there is no way to change the information. Black and white QR codes are a thing of the past. You can customize your QR codes with your branding for free with Beaconstac. You can also add your logo in the QR code to make it even more aesthetically pleasing. Once you're satisfied with all the details, click on ‘Generate QR code’ to create your QR code for free. It is important to test it now before you start using it. You can download the QR code in your preferred format - SVG, EPS or PNG. Not only can you create a QR code for product packaging, but you can also gauge how effective it is by tracking the number of scans by date, time and country. Beaconstac also allows you to retarget users who have scanned your QR code on Google and Facebook. Why is a QR code on product packaging so effective? 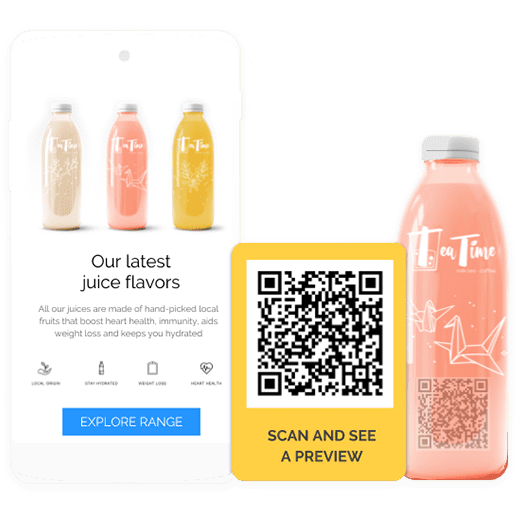 Since scanning a QR code does not take more than a couple of seconds, it is very simple to use QR codes to disseminate information to the consumer. What sort of product packaging can you put QR codes on? This is the packaging that the product comes in. The packaging could be anything from paper, carton, cardboard, plastic to glass and metal. These labels include a list of ingredients which is mandatory in the US for GMO products, date of expiry and any allergen information. These can be made colorful and alluring to make users want to scan the QR code. Include a video QR code, Social Media QR codes or a Website QR code here. You can also use primary packaging QR codes to allow consumers to add the product to their cart while shopping for instant checkouts. This packaging is what the product comes in. For instance, the box that houses your medicines, shampoo or makeup. This type of packaging also needs information such as product specifications, how-to-guides and best-buy dates. You can use URL QR codes, Social Media QR codes, PDF QR codes or YouTube QR codes here to disseminate such information. This is usually the boxes and crates that more than one product ship in. This can still be used to reinforce the branding with a Website QR code. The more colorful and vibrant your QR codes are, the more people will scan it and engage with your product. Do not add colors that render the QR code scannable. Always test the QR code before printing it out on product packaging. Also, ensure that the QR code you print out is not too small to be scanned (at least 2 cm x 2 cm). Always add a CTA that makes consumers want to scan your QR codes. Make sure your QR code is not placed on a fold or corner. It should be front and center and easy to spot. Create flyers with QR codes to help your customers redeem offer coupons and generate leads by initiating calls or messages. Enhance your credibility by adding QR codes on business cards that lead to your work samples, websites or social media profile. Get increased social media visibility & engagement by using QR codes on websites. Bookmarking your website made easier with QR codes. Incorporate QR codes on brochures to display your product listing and how-to videos, or share coupon codes and contact details. Boost your in-store traffic by sticking QR code posters on store window display and adding a compelling call-to-action. With QR codes on billboards & banners, you can help customers navigate to your store & advertise new launches.